Businesses of all sizes face a number of obstacles when they want to expand internationally. First, they must identify the right market to sell their products or services, such as custom men’s suits. Then they have to create versions of their website and ad campaigns in the language of the market they want to reach. Finally, and perhaps most importantly, they need to reach new customers who may be interested in their products and services. Starting today, businesses can access a number of new resources from Google to help them overcome these obstacles and start growing internationally. We’re launching a new website, called Google Ads for Global Advertisers, which will serve as a central hub for Google’s tools and tips for businesses looking to expand to foreign markets. This website pulls together resources for businesses to find the right market for their products and services, translate their websites and ad text, find new customers with relevant online ads, and understand options for international payment, shipping and customer service. We’re also introducing Global Market Finder, a new free tool to help businesses identify markets with high demand for their products or services. 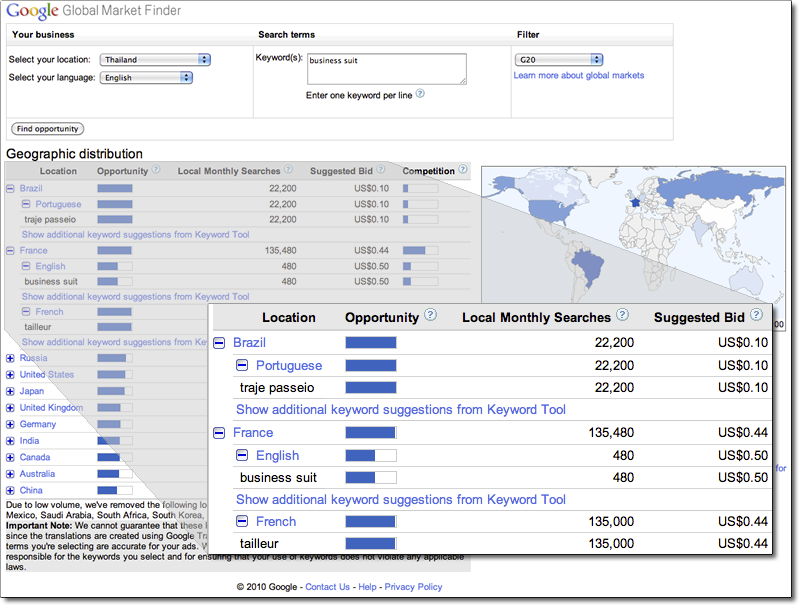 The Global Market Finder automatically translates your keyword—for example, [business suit]—into 56 languages and then uses Google search trends data to see where in the world people search for your product or service. 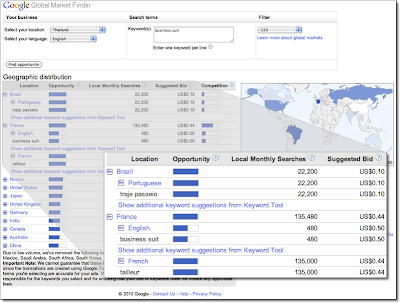 It helps businesses evaluate new markets by showing the volume of local searches, estimated price for keywords and competition for each keyword in each market. With this tool, businesses can answer questions like “how competitive is this market?”, “how does demand in one country compare to demand elsewhere in the world?” and “how much would it cost to start advertising in this new market?” You can read more about these new tools on the Inside AdWords blog. 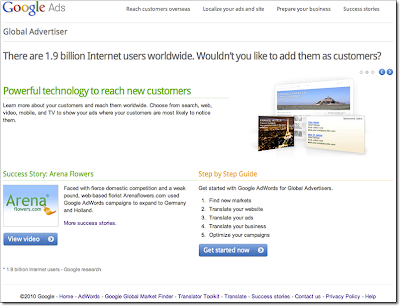 Google has already helped hundreds of thousands of businesses reach customers in foreign markets. From a mosaic company in Lebanon to a bespoke shoe retailer in Sydney, a tech support company in India and a bed and breakfast in Poland, tools like AdWords have helped businesses reach new customers and drive traffic to their websites. We think our new website and tools will encourage even more businesses to expand internationally, whether you’re a small business testing a single market for the first time or a mid-size company advertising your products to an entire region. After all, there are more than 1.9 billion consumers online. Wouldn’t you like to add some of them as customers?